Psychology, Sociology, Theology, and Fantasy. What more can we ask for? It doesn’t take much for me to be convinced to purchase a new series. However, The Twelve Kingdoms is an unusual title for me, for I didn’t actually buy it. In truth, the first two volumes in the series were presents from my fiancée’s mom. Lauren’s mom thought that the artwork looked neat and the story sounded intriguing, and out of all the things she could’ve picked up in the store, she chose that one. And now you know why I don’t mind marrying in to Lauren’s family. The show is based on a series of novels that go far beyond the 10 DVDs (and 45 episodes) of the anime series. Known as Juuni Kokki in Japan, Fuyumi Ono’s fantasy epic has been released in a number of different languages around the world to receptive fans. While we haven’t been treated to our own translation of the books just yet, the availability of respectable English-language editions of Musashi, The Guin Saga, Vampire Hunter D, Ring, Battle Royale, and Slayers gives me hope for the future of this fantastic work in English. Cross-world fantasies, or stories where a make-believe land coexists with the "real" world, have existed for a long time. Even in anime and manga, there is no shortage of stories that revolve around characters pulled from Earth to another realm. They range from action/adventures, such as Courtney Crumrin, Strange Dawn, Escaflowne, Magic Knight Rayearth, Tsubasa, and Spirited Away, to romances like Fushigi Yugi, Red River, From Far Away, Planet Ladder, and Princess Ai, to comedies like Those Who Hunt Elves, Dual, Magical Shopping Arcade Abenobashi, and El-Hazard. There are scores more...and I’m not exaggerating. They’re just as ubiquitous within the arena of American fantasy literature, with one of my favorites -- Magic Kingdom: For Sale, by Terry Brooks -- finally beginning the long and arduous process of becoming a film. One could easily argue that the Harry Potter series, as well as The Chronicles of Narnia also fall into this subgenre. The Twelve Kingdoms begins in modern Japan, in a school, naturally. There, we are introduced to Youko Nakajima, the main character of the series. Youko is a quiet girl who does her best to go unnoticed. She achieves good grades in school, she’s pleasant enough with her classmates to have several acquaintances, but she really doesn’t have many friends. The two people closest to her -- Yuka Sugimoto and Ikuya Asano -- aren’t exactly the greatest of friends. Sugimoto, an eternal pessimist, has never felt as if she belonged anywhere. She uses fantasy novels to escape the unwelcoming environment around her, and perhaps she senses an instinctual, kindred feeling of non-belongingness in Youko. She doesn’t admire Youko, nor does she share any interests, but due to this innate connection, she does make the attempt to talk to her. Asano is somewhat of a stereotypical guy in the sense that he’s just happy to be there. 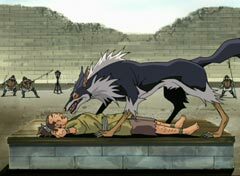 He isn’t really given too significant of a role in the first half of the tale, but both he and Sugimoto are instrumental in giving Youko a way to share her feelings with the audience. In a book, it’s easy to represent a character’s inner workings, but with anime, it would have been awkward to have Youko constantly thinking to herself. Thus, the writers of the show gave her Sugimoto and Asano so that she could bounce her thoughts off of them. The jump to the alternate land -- the land of the Twelve Kingdoms, that is -- is made in a spectacular fashion. After starting off somewhat slowly at the three initial main characters’ school, Youko is approached by an inordinately tall man with unbelievably long, silken, golden hair. 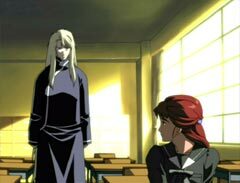 The man interrupts Youko’s class, introduces himself as Keiki, kneels in front of her, and then swears undying allegiance to the shocked girl. He explains abruptly that Youko’s life is in great danger. He also tells her that she should follow him if she doesn’t want innocent bystanders to come to harm. And then all of the windows in the schoolroom shatter, leaving a few of the students and a professor bloodied and unconscious. Youko isn’t quite ready to trust Keiki, but she’s stunned enough to follow him out of the room and up the stairs. On top of the school roof, Youko and Keiki run into Sugimoto and Asano, who apparently are more than just friends. 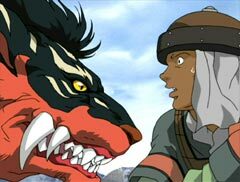 More important than a budding romance between the two classmates, giant monsters (known as kochou) attack the four. They eventually escape the creatures with the aid of youma (a generic term for monsters) who appear to be on Keiki’s side. 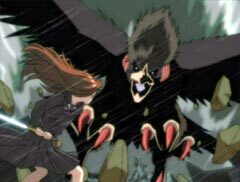 Keiki gives Youko a sword to defend them (mysteriously refusing to take part in the battle) and lends her a Hinman, a creature that takes control of her body when danger approaches. 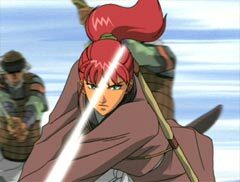 The Hinman uses Youko’s sword (and her body) to dispatch the kochou, and then Keiki summons a shoku, a giant whirlpool which acts as a portal to the Twelve Kingdoms, and all four of them go through. Youko passes out and is taken against her will by Keiki, but Sugimoto begs the man to take her with him. She’s been an outcast all her life, and she always knew there was a way out of the world that she hated so much. Asano decides to join the girls out of a desire to protect them, though he has no idea what he’s getting into. The Twelve Kingdoms explores many of the common themes found in cross-world fantasy yarns. First of all, Keiki claims that Youko is a queen. Many stories featuring alternate worlds feature characters living a normal (or even boring) life in the real world, only to discover that he or she is the prophesied savior of the fantasy kingdom. See Rayearth or Fushigi Yugi for other examples of this common plot device. Yet the story nimbly escapes the trap of becoming just another cross-world fantasy series with surprising swiftness. Perhaps due to the story’s literary origins, The Twelve Kingdoms boasts psychologically complex characters, an intriguing theological and political climate, imaginative landscapes, and no small amount of drama. It’s hard to predict what’s going to happen next in each episode, making the anticipation for the continuation of each storyline almost painful. To fully get into the story, viewers must first understand the rules that govern the world of The Twelve Kingdoms. For one, humans are not born from other humans. Women do not bear children. Instead, a couple hoping for children ties a ribbon on a holy tree, and if their wish for children is granted, then the newborn grows on it like fruit. There is a danger (though it does not happen terribly often) that a natural shoku might occur near one of the trees. When this happens, the developing baby can be snatched away from the Twelve Kingdoms and blown to Earth, where they find a spot in a womb and develop as we expect babies to develop. 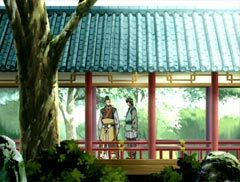 These children differ from kaikyaku, the term people use to refer to those from Earth who come to one of the Twelve Kingdoms, since they actually belong in the other world. Each of the Twelve Kingdoms has a ruler and a Kirin. The ruler is chosen by the powers that be, and only the Kirin knows how to recognize a monarch when the time comes to choose a new one. Though rulers and Kirin can be killed, they do not age, and if a king rules well, he will effectively live forever. However, if a liege starts a war or mistreats his or her people, a sickness will come over the peaceful Kirin. If a lord’s Kirin dies, shortly thereafter, the lord will die as well. Thus, bad rulers are controlled somewhat by the will of the heavens, and the worst time a kingdom can have is one ungoverned by the protective powers of a worthy monarch. There’s far more to the politics of the series than the details of the ruling class, adding to the depth of an already engagingly realistic alternate world. There is more than one major plotline running through The Twelve Kingdoms, as well. First of all, there’s Youko’s story. 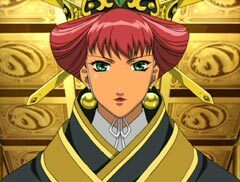 Everything begins with her entrance to the Twelve Kingdoms, and as she slowly learns to accept the fact that she belongs there, her character undergoes a great transformation. She entered the world as a frightened teenager, and the first quarter of the series are devoted to putting her in place as the Queen of Kei. But even after gaining the throne, she still needs to learn how to be an effective ruler. The fates of two other girls are also tied to that of Youko’s. One, named Shoukei, is a princess who has much to learn about life beyond the palace walls. When her introduction to the lifestyle of a peasant finally comes around, it is rather harsh. Once granted the immortality given to members and honored attendants of a ruling family, her status as an immortal was revoked when her father’s people rebelled against him. Shoukei witnessed the decapitation of the King as well as the slaying of her mother, and while she was allowed to survive, she was banished from the palace, the only place she had ever really known in her sheltered life. Shoukei heard of Youko’s ascension to the throne, and decided to make her way to Kei after learning that such a young woman was crowned. She was consumed by jealousy, feeling that if she could no longer live a posh life in a palace, then surely Queen Kei did not deserve it, either. 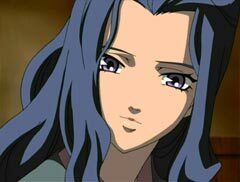 She left intent upon killing Youko, though situations are never as simple as characters believe them to be. Another girl, named Suzu, is really a girl in physical appearance only. 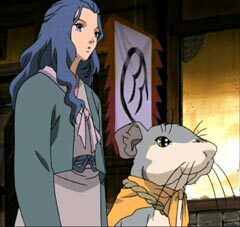 Suzu entered the Twelve Kingdoms almost a century before Youko’s arrival. She managed to survive there by traveling with a group of gypsy-like performers, though she never could figure out how to speak the native language. She gained a glimmering of hope when she caught the attention of a noblewoman. Suzu could comprehend the woman’s language, and she begged the woman to take her in. The noblewoman not only agreed to grant her the ability to understand the speech of the land, she also promised to bestow immortality upon Suzu. The condition was Suzu had to promise to serve her. The young girl (at the time) did not realize how terrible an unending life of servitude for a harsh mistress could be, but she quickly found out. Since that time, she’s had decades to regret her choice. Hearing of the young Queen Kei’s (as Youko is called) triumphant seizing of her throne, and more importantly, due to the fact that Youko is from Japan, like Suzu, she assumes that she’ll find a kindred spirit. 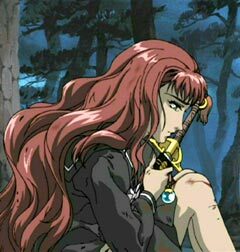 Aside from the inexperienced Youko, the self-centered Shoukei, and the timid Suzu, there is one major plotline that envelops every other story in the anime version of The Twelve Kingdoms. This one is centered on the Black Kirin, Taiki, who has been missing for years prior to Youko’s arrival. 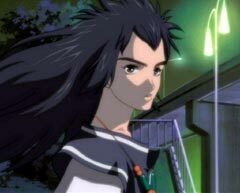 Taiki was lost to Earth in a Shoku while he was growing on a Riboku tree, but he was eventually found and retrieved by his Nyokai, a special kind of youma devoted to a Kirin. After a few years, however, he went missing again, and many people believe he returned to Earth for some reason. His true potential as a powerful instrument of change is the most significant element of the overall storyline, though more time is spent with Youko’s story than his own. New rulers may come and go, but it had been an immensely long time since the birth of a black Kirin, long enough that some people didn’t believe that the creatures even existed. The ramifications of Taiki’s birth take longer to discover than any other story element in The Twelve Kingdoms, but like every other plot point, they’re worth waiting for. The overall message of The Twelve Kingdoms seems to be that it’s easier to do what others expect of you than it is to be your own person. However, living a life where all conflict is avoided or ignored is not a satisfying way to exist, and there are things that are certainly worth fighting for. 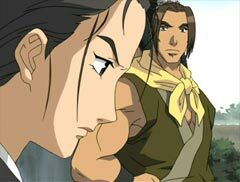 The Twelve Kingdoms does not boast flashy animation like Samurai Champloo. It isn’t filled with fan-service, either. The music, while beautiful, probably won’t top any local pop charts. However, the story, character designs, and sheer complex beauty of Fuyumi Ono’s breathtaking world make this a series that demands the attention of the mature anime fan. The show’s most impressive feat isn’t the way that it mesmerizes viewers with intricate battle scenes, the way it pulls tears from the eyes of those who experience it, or the way it coaxes laughter out of us at the most unexpected moments. No, more noteworthy than any of these achievements, The Twelve Kingdoms makes us think and care about a world that isn’t really all that different from our own.